144hz monitors are slowly becoming marginally affordable, enabling a wider audience to gain access to the benefits these products offer. Most are still quite expensive, especially if you look at the top-tier products that provide newer and more powerful tech, aggressive styling, and a lot of other extras. On the other hand, some companies offer solutions at different price points without sacrificing the essential features. Acer is doing quite well in this regard, with their Predator series for the high-end market and the XF series for the masses. This direction is quite good for the gamers since the advantages these products entail are within reach since there are now a lot of offerings that do not cost an arm and a leg. One such product is the Acer XF240H monitor, a product that offers 144hz refresh rates, fast response times and Freesync at a price point previously populated by boring and old mainstream monitors. At a physical standpoint, there isn’t a lot that can be said about the XF240H. The aesthetics are a stripped down version when compared to its Predator cousins, but this doesn’t entirely specify that this product is bad. This simplistic design is a direct effect of the pricing, and practicality dictates that the functions have priority over looks and accessories. The cabinet and stands have a matte black finish that appears close to being a darker shade of gray, which feels nice to the touch and does not attract fingerprints or dust. The industrial look can be enticing to some since there are a lot of consumers who are not fans of the gaudy, heavily accessorized designs that emphasize on the gamer concept. The Bezels surrounding the panel are thin enough to be unobtrusive to the viewing space, while also making this product ideal for landscape oriented multi-display setups. The OSD buttons are located on the lower right of this strip, and pressing them feels clunky, but still quite functional despite the flaw. I’d prefer some styling or a hidden position for unattractive buttons, but since this product biases towards practicality, what’s important is these buttons are functional more than aesthetic. Despite the flimsy buttons, overall build quality is superb and sturdy, and if you look away from the simple looks and focus on the performance of this product, it would be safe to say that this model is worth more that how it looks. 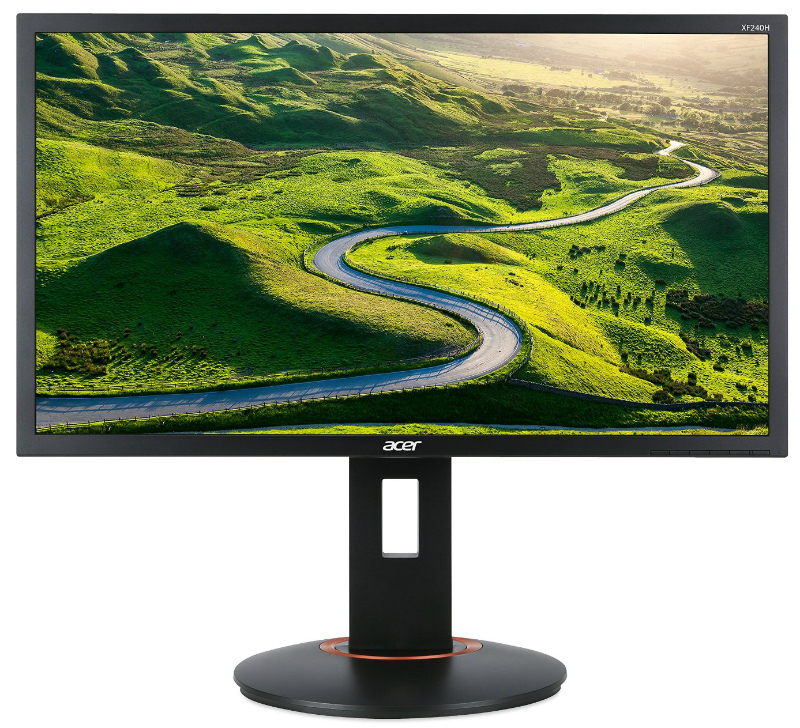 This product is a Freesync enabled monitor, and unlike the other similar products we are used to, connectivity is quite limited on the Acer XF240H. There is only one port for HDMI, DisplayPort, and DVI. These missing features are not entirely deal breaking, but in this case, less is more does not apply. You can, however, find USB ports on the side of the display to make up for the missing ports, since for the most part, you can’t expect a $200 product to have what more expensive options offer. The stand that comes with the package has a circular base with a red accent around the neck, and a square cable-tidy hole to hold your wires in place. While also limited in looks, the mechanism is quite good at its functionality and adjustments are smooth and easy enough to do with one hand. Although it is important to note that due to the base having a circular shape and limited footprint, the product is prone to tipping with minimal force. The stand also ships disassembled, so minor effort and tool usage is required. The mount also detaches to reveal 100 x 100 VESA holes, in case the owner decides to apply an aftermarket solution. To top things off, Acer has included two 2-watt speakers, which sound tinny and harsh when compared to a better pair. Even if they are low-quality sets, their addition is a welcome feature for a product in this price range, since most affordable products do not even have these in their spec list. The Acer XF240H features a 24-inch TN panel capable of 144hz, 1ms response time and 1000:1 contrast ratio. These are the same specs on the higher tiered TN models and are also the most important things to look at when considering to buy a gaming monitor. Viewing angles are of course quite bad due to the nature of TN panels, but this isn’t something a little ergonomic adjustment couldn’t fix. Out of the box, the colors were awfully washed, and the screen was blindingly bright. But upon adjustment of some settings in the OSD, the picture instantly became better and on par with the other high-rated models we have reviewed. Setting the gamma to 2.2, brightness to 25 to 35 (depending on ambient lighting) and adjusting the color temperature (RGB) and saturation improves the images a lot. After playing around with these settings, games instantly became vibrant and alive, and overall image performance became comparable to more expensive competitor products adding outstanding value to this already low-priced model. Users can also search the web for color profiles they can use from professionals who use calibrators, and since this product is notorious for having poor out of the box performance, there are a lot of helpful users who have successfully tweaked their sets to find the perfect color settings. One thing we have noticed in testing is that once the frame rates reach near the peak 144hz, colors again became a little washed out or faded. These can be alleviated by limiting the frames to 120hz, which does not induce a noticeable change in the smoothness of the picture while upholding the color quality the adjustment settings we selected. There is also an obvious issue when applying changes in the Nvidia control panel since the Acer XF240H reverts to default settings if you chose to go this route. We recommend users to adjust all of the options in the Acer OSD to avoid experiencing this annoying flaw. At the XF240H’s native 1920 x 1080 resolution, most computer builds are fully capable of high FPS outputs to maximize the 144hz refresh rates, but for some specific games such as Witcher 3 or Battlefield 1, frame rates may dip quite often. For this dilemma, this product comes equipped with AMD’s Freesync. Once activated, these titles became smooth again, and screen tearing and blurring became unnoticeable despite the deep dives our frame rates took in fight scenes. Although at 1080p, you might not need this feature if you mostly play competitive titles such as Overwatch or CS: GO; the games where fast framerates matter more than amazing visuals do. In this regard, this monitor comes highly recommended while being used with the suggested tweaks mentioned above. If that’s not enough, the screen on this product is also flicker-free, and for the most of our gaming tests, we did not feel any dizziness or nausea usually caused by products which rely on PWM power systems to control brightness. 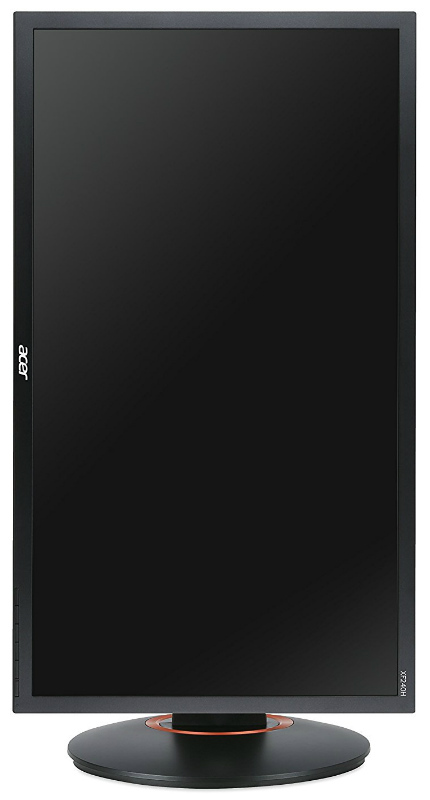 This feature is also a significant yet unnoticed improvement this model offers over its predecessor, the Acer GN246HL. At a $200 price point, the Acer XF240H is one of the best 144hz monitors you can get in the current market. This product does not offer the bling and extras that come with products almost double its price, but the performance after tweaking is undeniable. There are accompanying issues such as color degradation at 144hz and the Nvidia control panel reverting settings to default issue, but these are minor problems easily fixed with a little tinkering and testing. Nothing a true enthusiast would find too difficult to solve. The aesthetics are also quite simplistic, but the product we tested surprisingly felt sturdy and made of high-quality materials. Adjustments are smooth but firm, so the display retains your preferred position without any problems. If you are however looking for a plug and play product, you may have to look elsewhere, or you could spend more to get something that fits in that regard. One thing is for certain, if you are looking for a gaming monitor without spending a fortune, Acer’s XF240H fits the bill quite nicely despite its small issues. Is there a difference netwerk the Acer XF240H and the Acer XFA240? Hi, Daan! The XF240H is FreeSync compatible using its DisplayPort 1.2 and HDMI slot while the XFA240 is limited to DP only. Cheers! Is there any DisplayPort with the monitor? Hi, Emil! Yes, the Acer XG240H has a single DisplayPort. Cheers! Whats the input lag of this monitor? Hi, Risaar! It’s at 4ms, which is unnoticeable for most gamers. Cheers! Some people say this monitor sometime the screen will go blackout it’s true? Hi, Shah! We did not experience the issue you mentioned when we reviewed the XF240H. It could be a bad batch of monitors or driver issues. I bought the xfa 240 monitor from amazon because it said it had G-Sync, just got it and the box says it’s free sync, I dont have an AMD graphics card, I have a nvidia graphics card, will this feature still work? This means that Nvidia has verified it as a adaptive sync monitor than can do G-Sync. You’ll have to watch a tutorial video on how to set it up though, (one by JokerProductions is really good) but it will work just like a G-Sync monitor once you have it setup. Hi..Will this monitor works using new gsync driver? Hi, Bluecrimson! We cannot guarantee that it will work with G-Sync at this time, but it most probably will since several monitors with same specs have worked for other users. What is the difference between Acers XB240H and Acer XF240H? Hi, Valentin! The XB240H is an older G-Sync variant while the XF240H is FreeSync-compatible. Check name product you listed Asus XF240H should be Acer. Nice write up. Thank you, Danial, for liking our review and pointing that error out! It has been corrected thanks to you. Hey Mike! Thanks for taking the time to read and point that out. Typo is already corrected.